Built by the Nabataeans thousands of years ago, the ancient city of Petra was lost to the ages until it was rediscovered by Johann Burckhardt in 1812. Even after its rediscovery, not many visitors came to Petra. It wasn’t until the site was featured in the third Indiana Jones movie in 1989 that visitor numbers started increasing, and today, more than 500,000 people visit annually. Here are some of Petra’s most famous appearances on the big screen. In the third installment of the Indiana Jones series, Indy’s quest for the Holy Grail takes him to the Canyon of the Crescent Moon and the Holy Temple, where the Holy Grail was hidden. In reality, the Canyon of the Crescent Moon is the Siq, the narrow gorge that visitors first pass through at Petra, and the Holy Temple is Al Khazneh, or the Treasury, the massive rock-hewn temple and memorial at the end of the Siq. Visitors can walk along the Siq themselves and take in the amazing view as it opens up to Al Khazneh. Most of the desert scenes in The Mummy Returns were actually shot in Morocco, but some of the train scenes were shot on the Hejaz Railway in Jordan. Petra also makes an appearance, and its canyons and gorges feature in the scenes where the giant wall and skull of water created by Imhotep chase the hero and heroine in a dirigible. The second installment of the Transformers franchise features Petra’s Al Deir, or Monastery, as the Tomb of the Primes. In reality, Al Deir is a temple on top of a mountain, which created some logistical difficulties. The scenes were finally shot with the help of the Jordanian Air Force, which lent helicopters to transport the crew and equipment. Visitors will have to climb the more than 800 steps to the top themselves, but viewing the majestic Al Deir and the surrounding scenery makes it all worthwhile. Enjoy tours of Petra, Wadi Rum and the Dead Sea on this 3-night private tour of Jordan’s wonders from Amman, with your own private guide. Head south from Amman for a guided Petra tour: seeing the best of this age-old, UNESCO-listed rock-cut city. The next day, explore the spectacular desert valley of Wadi Rum, and ‘swim’ in the salt-rich waters of the Dead Sea. Three nights of accommodation in Amman and Petra; daily breakfast and dinner; and airport transfers at the start and end of your trip are also included. 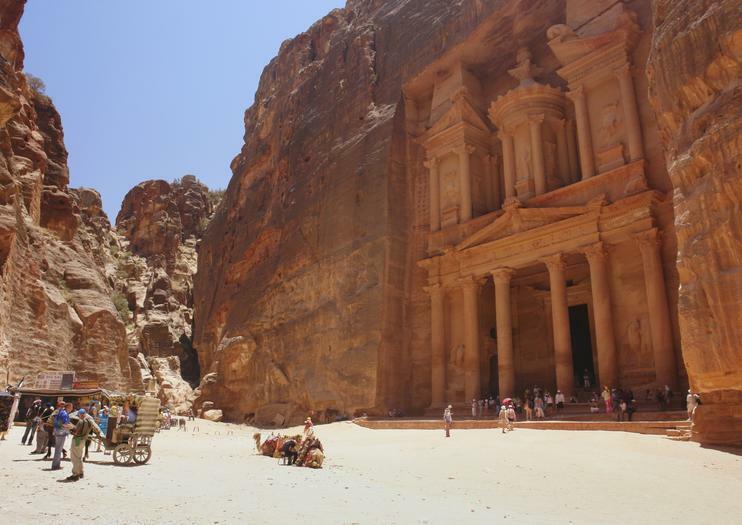 Explore Petra, Wadi Rum and Aqaba in Jordan on this 4-day tour from Amman, with a private guide. Leave Amman for a guided visit of UNESCO-listed Petra, and then continue to the Wadi Rum desert valley. Stay overnight at a tented camp complete with a delicious campfire dinner, and enjoy a morning 4x4 ride around the spectacular canyons and dunes. Lastly, lounge on the beaches of Aqaba. Two nights of 3-, 4- or 5-star accommodation, one night at the Wadi Rum desert camp, and daily breakfasts and dinners are included. Visiting Petra alone from the Dead Sea involves hiring a driver on the ground—risking you not getting the day that suits you. Prebook this private full-day tour to save time and secure your ideal date. Then, on the day, travel by private air-conditioned vehicle and on arrival, enjoy the freedom to hire a local guide or self-guide for greater flexibility. Guiding fees and admission are at your own cost. Experience magnificent Petra and the Dead Sea on this private 2-night Jordan tour from Amman. After a night in Jordan’s bustling capital, meet your private driver-guide and travel to UNESCO-listed Petra. Take a private guided tour of the ancient, rock-hewn city before continuing to the Dead Sea for an overnight stay. Here, ‘swim’ in the salt-rich waters and enjoy the beautiful setting and your hotel facilities before your return to Amman. Daily breakfast and dinner, your choice of hotel accommodation on both nights, and airport pickups and drop-offs are included. Explore the Valley of the Moon on this private 2-day tour to Wadi Rum from Amman. Take in panoramic views over Wadi Rum’s rugged gorges, dry riverbeds and rose-red desert as your driver sheds light on the region’s history and heritage. Enjoy traditional meals by the fireside at a Bedouin camp, and sleep soundly in your comfortable tent under the stars. Awake to the peaceful silence of the desert before returning to Amman.